Today I found out about the Union Army Balloon Corps. If you thought that air warfare was reserved for a time after airplanes were invented, you thought wrong. During the American Civil War, the Union troops used hot air balloons to spy on Confederate troops. The idea to use balloons was the brainchild of Salmon P. Chase, the Secretary of the Treasury, and Joseph Henry, the Secretary of the Smithsonian Institution. They suggested that the military should create the balloon corps under the command of Thaddeus Lowe to do some “aerial reconnaissance” for the Union. On June 17, 1861, Lowe demonstrated his balloon in front of President Abraham Lincoln. He went up to the lofty height of 500 feet and flew the balloon the short distance between the Washington Mall to where the National Air and Space Museum now stands. Lincoln had doubtless seen hot air balloons do such things at fairs for years; what made this journey special was that the balloon was hooked up to a cable that linked an air bound Lowe to the War Department. Soon after, Lincoln wrote to General Winfield Scott about Lowe’s abilities. However, when Lowe presented himself to the general, he found that Scott was less than impressed. Lincoln ultimately had to personally intervene to get the general to accept Lowe into the ranks. In August 1861, the first army balloon was constructed and named The Union. The balloon depended on tapping into Washington D.C.’s natural gas lines, so it wasn’t able to go very far. However, the next month Lowe was able to take his balloon up to 1000 feet and spy on the Confederate troops residing at Fall’s Church, VA. With his direction, Union troops were able to accurately aim at enemy troops without actually seeing them. This was a military first, and the success resulted in the establishment of the Balloon Corps. The first order of business was to hire more aeronauts. 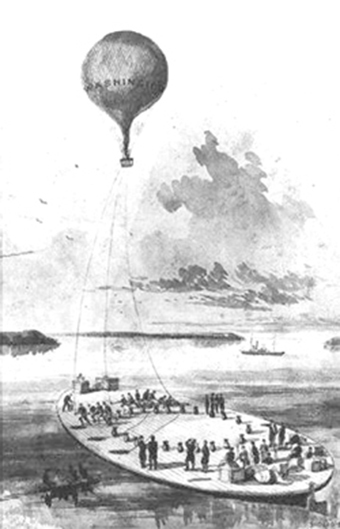 Around October 1861, a number of balloons were tethered along the Potomac River. From their vantage point, the people manning the balloons were able to see any Confederate activity up to a day’s march away, giving the Union time to prepare a plan of defence. After a short period of time, balloon technology advanced. Lowe himself invented a way to make gas portable: a wooden tank lined with copper, set up on a wagon that also carried water, iron, and sulfuric acid. Combined, these wagons produced hydrogen gas which lifted the balloons up. 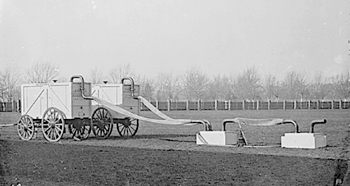 The army had twelve wagons built to aid the balloons in long-distance missions. Each of them weighed 1000 pounds. Throughout 1862, Lowe continued to go on reconnaissance missions, noting on maps where Confederate troops were located. When he travelled at night, he would count campfires. It wasn’t all good news, though. The Confederate troops quickly caught on to what was happening and started shooting at the balloons with guns and cannons. Luckily for the people in the balloons, it was pretty difficult for soldiers on the ground to actually hit them—and it was easy for the soldiers in the balloon to gun down anyone who took a shot. When shooting failed, the Confederates learned how to cloak their positions with camouflage and blackouts, making Lowe’s job more difficult. If Confederates made fewer fires, then Lowe’s estimates of their forces would be low, and the Union troops would underestimate the South’s strength. They would also paint fake cannons black and set them up around camp, so that if a balloon happened to fly over while it was still light, the North would think that they had too many resources to chance a fight. These fake cannons were called “Quaker guns” because they were, like the pacifist Quakers, completely harmless in war. The South did set out to copy the balloons’ success at one point, but they lacked the technology and resources required to make their balloons practical. The first Confederate balloon was difficult to control, as it was made out of varnished cotton and kept aloft with hot air. The balloonist did manage to draw a map of Union positions around Yorktown despite the difficulties, however. A second attempt was less successful. A balloon made of silk (said to have been sewn from the gowns of Southern Belles) was tied to a tugboat and dragged along the James River before the tugboat crashed and Union troops took control of the balloon. The Union Balloon Corps met its demise before the end of the Civil War. With a switch of command in 1863, funding was cut to the program which meant that the balloonist could no longer continue staying aloft. On top of that, Lowe himself was accused of “financial impropriety” and forced to resign. Lowe had become the driving force behind the entire campaign, and without him to advocate for the corps, it disbanded. In addition to the technology of balloons, the Civil War saw a significant use of telegraph machines on both sides. The Union sometimes handled upwards of 4500 telegrams a day reporting on Confederate movements. Both sides encrypted their messages with ciphers, and both sides learned how to tap telegraph machines. Sometimes, messages would become unreadable due to mistakes made on behalf of the people sending them. Robert E. Lee hated telegraphs and even ordered his officers not to send anything, lest the Union find out what the messages contained. Before he was appointed Chief Aeronaut, Lowe was simply an aeronautic scientist. A week after the fall of Fort Sumter, which kicked off the Civil War, Lowe could be found on a nine hour balloon trip from Cincinnati, Ohio, to Union, South Carolina. When he landed, Confederate troops accused him of spying for the Union. They were eventually convinced of his innocence—something they regretted later—and Lowe returned to the North, where he learned that Mr. Henry wanted to talk to him. Lowe continued to be passionate about flying. He also made the “railway into the clouds” in California, which took passengers to the summit of Echo Mountain. But one of his biggest legacies is that of his granddaughter, the remarkable Pancho Barnes, who also caught the flying bug. In the opening paragraph the author writes: ” . . . the Union troops used hot air balloons . . . ” They did not! There is a distinct difference between balloons that rise from heated air and those that rise with lighter than air gas. The only ‘Montgolfier, or fire balloon’ (one that used heated air) used during the Civil War was the first balloon used by the Confederates in April of 1863. All the rest: the 5 personal balloons brought by the aeronauts at the beginning of the war, the 7 built under Union Army contract, and 2 additional Confederate balloons, used City Gas (distilled coal) or hydrogen.